Thread: External laptop graphics adapter. Yup you read the title right. Found this pretty interesting and had no idea this was even possible. So you want better graphics for your laptop, It just so happens the make an adapter for that. 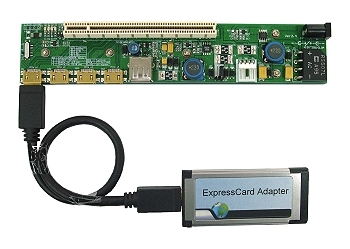 No joke check out this kit you can buy, you can get this PCI Express 16X card slot for around $85 bucks, seems kinda pricey but some might like it for something. That is pretty cool. Only negative to it, really, is the fact that you have to use a PSU instead of a wall outlet. If it used a wall outlet (or at least offered that ability with like a 12v brick), it'd be all around awesome. ASUS has a cool device that will allow laptop users to use the latest and greatest videos cards just like PC user can. The case is about 4 inches high and is a little wider and longer than a graphics card with a control dial and a graphical display. Man that would of been something finding that toy, I'd have to say its pretty sweet how far the can push hardware like they do.